A University of Wyoming faculty member is part of a multi-university research effort to predict and manage the interactions between toxic plants and the animals that consume these plants. Rongsong Liu, a UW associate professor in the Department of Mathematics and Statistics, is part of a project, titled “Genomes Underlying Toxin Tolerance (GUTT): Identifying Molecular Innovations that Predict Phenotypes of Toxin Tolerance in Wild Vertebrate Herbivores.” The research is funded through a $6 million National Science Foundation EPSCoR (Established Program to Stimulate Competitive Research) grant. The grant began Aug. 15 and runs through July 31, 2022. The GUTT team will reveal how herbivores and their gut microbes tolerate defensive toxins produced by the wild plants they consume. 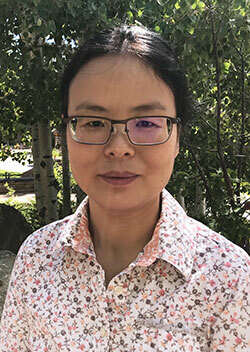 “Increased understanding of plant toxins and herbivore tolerance is important for conservation biologists who manage native plants and herbivores; the ranching and agricultural communities that rely on plants to feed livestock and rely on chemicals to defend crops from pests; and the medical community that relies on plant-derived chemicals to manage human health,” says Liu, who also has a quarter appointment in UW’s Department of Zoology and Physiology. This better understanding of plant-herbivore systems requires the expertise of many scientists with different specializations who will advance science and education by cooperating across state boundaries, she says. This cooperation will require integration of genomics, chemistry, physiology, evolution, microbiology, population ecology and modeling expertise in Idaho, Nevada and Wyoming along with state and federal partners. In addition to Liu, the scientific leadership team includes Jennifer Sorensen Forbey and Eric Hayden, associate professors in the Department of Biological Sciences at Boise State University; Marjorie Matocq, a professor in the Department of Natural Resources and Environmental Science, and Lora Richards, assistant professor in the Department of Biology at the University of Nevada-Reno; and Carolyn Dadabay in the Department of Chemistry at the College of Idaho. Four other UW faculty members also are involved. Jeff Beck, a professor in the Department of Ecosystem Science and Management, will coordinate the collection of field data in Wyoming. Bledar Bisha, an assistant professor in the Department of Animal Science, will contribute to microbial metabolism of toxins. Kevin Monteith, an assistant professor in the Department of Zoology and Physiology and in the Haub School of Environment and Natural Resources, will link physiological data to demographic data of herbivores. And Derek Scasta, an assistant professor and rangeland extension specialist in the Department of Ecosystem Science and Management, will transfer results predicting demographics of wild herbivores to domestic species. The GUTT team members will integrate their expertise to identify how variations in toxin tolerance influence the physiology, behavior and population dynamics of wild mammalian and avian herbivores. Additionally, the GUTT team will work with high school teachers and use course-based undergraduate research experiences in introductory biology, chemistry and math courses to train, inspire, recruit and retain a diverse workforce capable of applying genetic understanding of toxin tolerance in animals and microbes to conservation, agriculture and human health. The research and educational activities will grow capacity for Idaho, Nevada and Wyoming faculty, students and community partners to more effectively manage toxic plants and the animals, microbes and humans that interact with the plants, Liu says. The GUTT Workforce Development plan leverages leaders in innovative research and transferable educational practices to build inclusive research and education capacity for 18 early career faculty who represent marginalized groups in science. The training programs help Western states and GUTT’s agency partners increase participation from underserved populations; low-income, rural and first-generation college students; and women through diversity programs, citizen science and outreach.